If I were in the telecom industry this would be a great background shot. 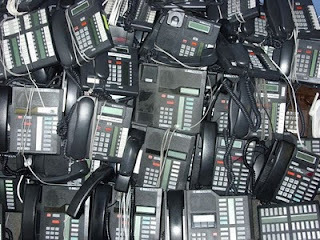 In Old City Hall, there was a big pile of old phones. 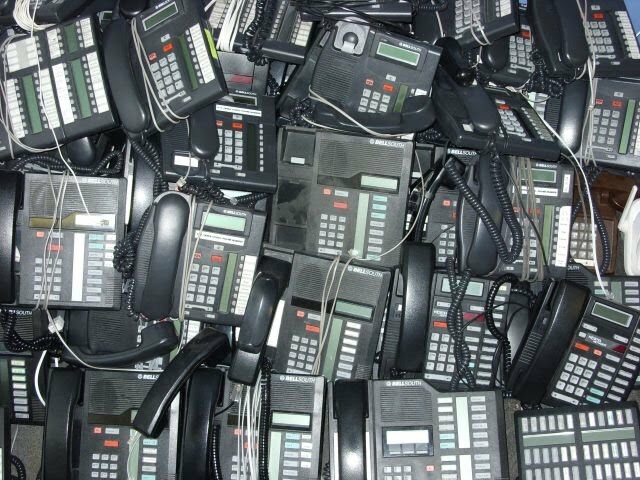 Apparently that is a problem everywhere with old phone hardware companies going out of business and the technology shifting over to Voice Over IP systems. This was part of the surplus equipment that is being sold off from Old City Hall this weekend. There's going to be a yard sale over at Hagen Park, and I'm signed on to do a shift early at the sale. Hopefully the weather will hold out so that the sale and the proceeds will go to the Historical Society of Wilton Manors. There are a lot of items left over and you may see something you could use. If you have been watching this blog over the last weeks you have seen the pictures from inside Old City Hall and most of those pictures will have something that you may want. I know there's a lot of desks and office furniture as well as filing cabinets and so forth. I'll get to be an early bird for this one since I'll be part of the staff. This way if I spot something, I may beat you to it. need one think there will be any left if I get there at 8:01?